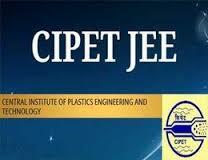 CIPET JEE (Central Institute of Plastics Engineering & Technology Joint Entrance Exam ) is the entrance exam conducted to grant admissions to the candidates who wants to join in Under Graduate and Post Graduate courses in plastic technology. It was established in 1968 by Government of India with the assistance of United Nations Development Programme (UNDP) at Chennai. The main objective of setting up of the institute was to develop manpower in different disciplines of Plastics Engineering & Technology as no similar institute was in existence in the country. CIPET (Central Institute of Plastics Engineering & Technology) renders Technology Support Service in the areas of design, tooling, plastics processing and testing and quality assurance in India and abroad. For PGD-PPT: Minimum educational qualification of 3-years degree in science with Chemistry as one of the subjects is required. For PGD-PTQM: 3 years degree in science passed with Chemistry, Physics and Math’s. For PD-PMD with CAD/CAM: 3 year Diploma in Mechanical, Plastics Technology, Tool/Production Engineering, Mechatronics, Automobile Engineering, Tool & Die Making, DPMT/DPT (CIPET) or equivalent is the minimum educational requirement for this course. For DPMT & DPT: Those who have passed 10th standard with Math’s, Science and English are eligible to apply for this course. There is maximum age limit of 25 years for PGD-PPT, PGD-PTQM, PD-PMD with CAD/CAM and 20 years for DPMT and DPT. Relaxation in the upper age limit is provided to SC/ST and North Eastern Region candidates. Age limit shall be evaluated as on 31st July, 2018. The application form will be available via online mode only, candidates are required to create a log in and password in the official website www.cipet.gov.in. Candidates must attach the required documents required with the filled-in online application form are attested photocopy of DOB certificate, attested photocopies of X / Diploma / Degree Certificates, attested community certificate [for SC, ST, OBC (NCL)], residential proof for North Eastern State Region, if applicable. You need to then upload recent photograph and signature in valid format. The application fee can be paid through online and offline mode. Online Mode: Candidate can pay fee using Debit card/Credit card or net banking. The paper will be in Multiple Choice Questions Format. Each section will consist of 30 questions and maximum 30 marks will be given for each and GK will consist of 10 questions. Time duration will give only 2 hours to complete the question papers. CIPET JEE 2018 hall ticket will be issued in the last week of May. Admit Card will be released two weeks before the exam in the official website, where the candidate can download by entering their application ID. The candidates will not be allowed inside the examination without the hall ticket, in case if the candidate is not able to download their admit card online then they have to report to the exam controller to re-issues the admit card. The candidates must bring the admit card with any ID proof card documents to examination center. Results will be declared online in the official website, they can download by entering their registration number. Admission will be purely done on the basis of candidate’s performance in the entrance examination. Selected candidates can download their admission call letter in the third week of June from the official website of CIPET. Candidate has to decide the choice of course before he wish to appear for CIPET JEE counseling, but based on its ranking he/she may get the course of his choice and the seat allotment will be done on the basis of merit list. Candidate will have the option to withdraw from the counseling.